Is your toilet constantly clogged? Are plungers failing to clear the problem? Don’t rely on quick fixes that may end up damaging your system. For Annapolis clogged toilet repairs, call Heidler, Inc. at (410) 268-7191. Click here to view our current specials and discounts. If your toilet is frequently clogged, it may be time to call for a professional solution. 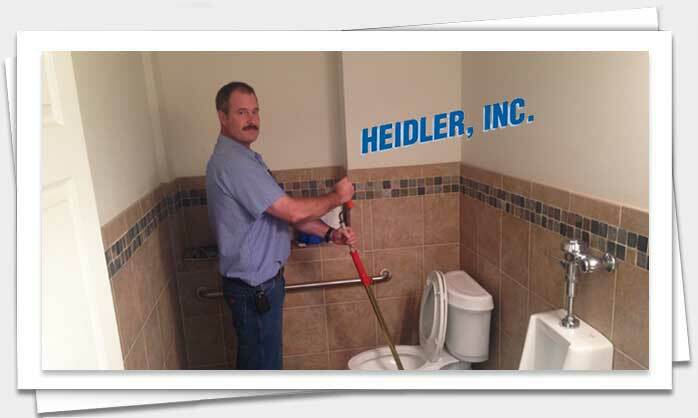 Heidler, Inc. is your Annapolis clogged toilet repair team. We have the tools to track down whatever is blocking your pipes and remove it. Completely removing blockages is the most effective way to prevent further clog development. Click here to visit our customer reviews page and see how we have helped your neighbors. There are several factors that lead to a clogged toilet. The most common cause is flushing excessive amounts of toilet paper, or flushing foreign objects down the line (this can include anything from heavy paper towels to diapers). Once these difficult to flush items enter your drain line, they can cause immediate clog problems. You may also have trouble flushing your toilet if there is a blockage farther in your sewer line. These blockages may be caused by tree roots choking the pipeline, debris or sludge buildup, or severe corrosion. Once you have scheduled an appointment with us, we will arrive promptly at your home with all of the necessary tools to remove the clog. This includes industrial-sized snakes that can help clear a clog in minutes. If the blockage is in your sewer line, we will use a video camera to identify the exact location of the blockage. This allows us to easily remove the clog without having to excavate your property. The methods we use—whether through snaking or hydrojetting —will help eliminate the clog without hassle. We will help you and your family return to your normal routine as quickly as possible. How can you avoid clogs in the future? The best way to avoid a clogged toilet is to be mindful of what is flushed on a regular basis. While toilet paper dissolves easily, flushing excessive amounts can create problems over time. Other products that should never enter your drains include wipes, napkins, paper towels, and other items that will not naturally dissolve in your pipeline. By being conscious of what enters your drains every day, you will be able to avoid most toilet problems. If you do experience a clog, contact us right away for fast solutions that are safe on your pipes and effective enough to keep your toilet running efficiently. We will completely remove any items blocking your drains and make sure your unit stays clog-free. You will receive guaranteed quality solutions and flat rates. Call us today at (410) 268-7191 to get out of your clogged toilet problem.